We’ve been updating people about Iron Eagle Trailers’ new website in our newsletter recently without really celebrating the awesome news the site introduces – the PAD Series Trailer, designed specifically for tiny homes on wheels! We put our heads together this past summer (Dee Williams — aka me–, Derin Williams from Shelter Wise and Rob Mandzig from Iron Eagle) and now they’re building a trailer that I think is the best tiny house trailer out there. Iron Eagle: The Best Tiny House Trailer! PAD has been working with Iron Eagle for years. They have fabricated all of our tiny house trailers – the foundation for Tammy and Logan’s house, my new vardo, and the Sweet Pea. They’ve fabricated the trailers for all of the Shelter Wise tiny homes and many others along the way. Iron Eagle has a great, detailed list of why they think their PAD Series trailers are fantastic, and I encourage you to take a look at their website for details and costs, but I want to offer a bit of information about why I think their trailers are superior. This is pretty tech-geeky stuff, but it’s also vital to be thinking about when you’re investing in the foundation of your tiny house on wheels. Building a house involves making many different decisions about products you’ve never thought about before, for which there aren’t necessarily a bunch of Amazon or Yelp reviews to guide you through, so we want to save you some trailer head-scratching and tell you about a worry-free option. This new trailer has recessed ribs and deep side-rails to receive a wooden floor box that can be properly secured to the trailer. By setting the top of the wood floor flush with the top of the trailer, instead of placing it above the trailer frame, you create more vertical living space inside your house. The recessed ribs also provide ample room for insulation, which allows you to minimize cold or heat conducted across the metal, into the wood floor and into your house. A perimeter flange extends the width of your house an extra foot, offering you more square footage for living space inside your house. 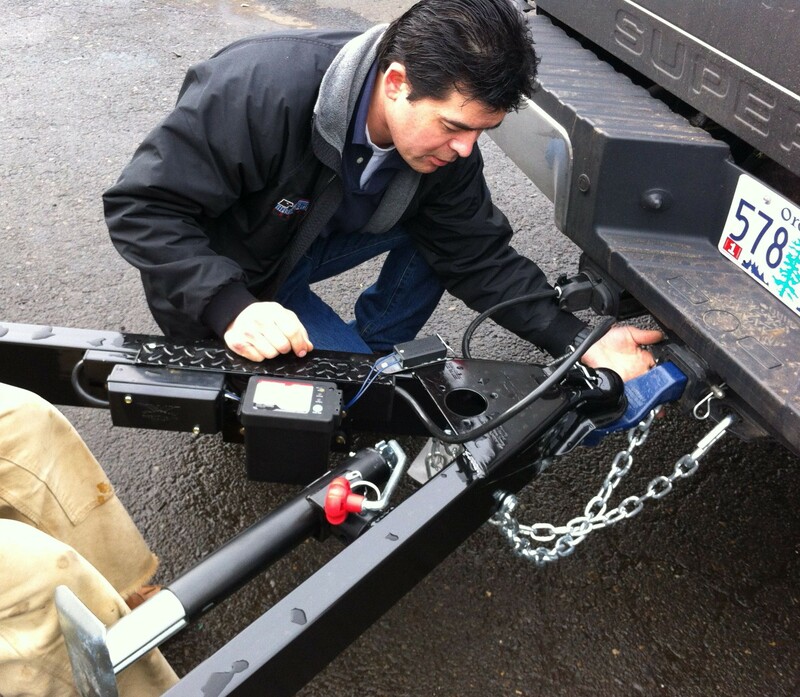 It also creates a perfect way to connect tension ties and bolts between the walls, the floor and the trailer. The axels were selected and placed especially to support a super heavy and sometimes top-heavy structure – like, say, a little house. And they’re built to minimize any potential for fish-tailing, and with beefy brakes and lights. Aside from the technical stuff, here’s why I want the members of the tiny house community to meet Iron Eagle: they’ve been making trailers AND working with the tiny house community for years, which is a hard combination to find. And working with someone who understands your project both feels better, and makes the process run more smoothly. Kate Goodnight offers a great write up of her experience on her blog (plus a whole lot more informative details about her tiny house building process), but here’s a recent example from my trip to Japan too. I hadn’t really thought about size when Yuichi asked me work with Iron Eagle to get two trailers shipped to Japan. After a bit of back and forth, we learned that the best way to ship them was to stack them like pancakes and load them in a 7.5-foot-wide cargo container. This was a challenge because most tiny house trailers are 8.5-feet-wide. We looked into flipping them sideways or loading them diagonally, but they wouldn’t fit in the container. Luckily, Iron Eagle was able to save the day by fabricating a couple of skinny 7.5-foot-wide trailers to fit pancake-style inside our shipping container. YES! The trailers were on their way! And ironically, after everything was sorted out, I learned that it would have been illegal to have a wider trailer in Japan. Yuichi’s Bento Box will be 7.5-feet wide at the base, just like the little baby trash trucks and fire trucks that I saw racing through Tokyo. The 7.5 foot wide “Bento Box” tiny house in Japan. The long and the short of it (A little “How wide is your trailer?” humor) is that Rob Mandzig of Iron Eagle is a resource that anyone building a tiny house should know about. He’s happy to work with you on your unique design, provided it meets some of their engineered restrictions on size. Even if you live far away, getting the right trailer might be worth the effort so you can start your project in the best possible way. If you have any questions about what they do or how they do it, just call them up. And if you tell them PAD sent you, they’ll even give you a $50 discount on their new trailer design! How’s that for tiny house friendly? Take the Tiny House Survey! Can You Buy A Used Tiny House Trailer?